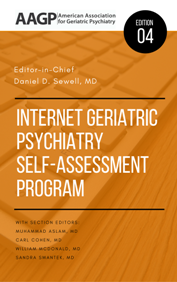 The internet Geriatric Psychiatry Self-Assessment Program has been developed by the American Association for Geriatric Psychiatry to provide a vehicle for continuing education of the psychiatrist in clinical practice. The self-study questions, answers, and critiques that comprise the program are based on the current medical literature. The iGPSAP program is designed as a self-study educational program. It is not intended as an examination. Members of the editorial board strive to provide an educational experience relevant to the practice of Geriatric Psychiatry based on members' need assessment. The iGPSAP program is designed to support the educational mission of the AAGP to provide continuing medical education (CME) for the membership pertinent to the practice of Geriatric Psychiatry in all its diverse aspects (AAGP CME mission statement, November 2007). Members of the iGPSAP Editorial Board serve in accordance with the policies and procedures of the AAGP for editorial boards. The editorial board defines the objectives of the iGPSAP program to fulfill the iGPSAP CME mission. Editorial board members are responsible for editing and revising submitted materials, assuring the quality of the program, and evaluating the content of the publication based upon AAGP member needs. This edition of the iGPSAP differs from previous editions in a number of ways: 1) in keeping with the evolution of how we both teach and learn, it is being published only in digital format; 2) the number of questions has been expanded from 411 to 500; 3) all of the questions have been written using the same question writing guidelines used by the ABPN. These guidelines include ordering potential answers alphabetically when answers involve words or from smallest to largest when answers are numeric; 4) it no longer includes a Question Book and a Critique Book, and 5) it has been approved by the ABPN as a certified self-assessment (SA) CME activity. Successful completion of the iGPSAP 4th Edition is worth 42 SA CME. In order to receive this approval, the iGPSAP 4th Edition software will allow you to compare your performance with your peers. To read a question, answer the question, read the discussion, and review its references will take an average of 15 to 20 minutes. Thus, completion of the 500 questions allows the physician to claim a maximum of 42 AMA PRA Category 1 Credits™. Physicians should only claim credit commensurate with the extent of their participation in the activity. Confidentiality for participants of the AAGP iGPSAP program is protected. The evaluation of participant satisfaction contains questions about participant demographics and iGPSAP program contents and evaluation. Participants are asked to comment on their educational needs, the comprehensiveness and depth of the questions, and the source materials. The iGPSAP Editorial Board will refine program content and format by reviewing these evaluations. In addition, iGPSAP content is influenced by AAGP peer review experiences, closed claims activities, and other AAGP committee reports. Go through the questions as many times as you wish just by starting a new "exam," then compare your results to see progress. In "learning mode," you can see immediate feedback on incorrect answers, change your answer, and read discussions as you go along. In "exam mode," you see no results or feedback until completion to better simulate an actual examination. Some subscribers will wish to start in "learning mode," to gain as much knowledge as possible; then perhaps try "exam mode" to see how well they're doing in a more formal setting. Others will prefer to begin immediately in "exam mode," see their results and only then try "learning mode" to brush up on their areas of weakness. With these features, you can use each chapter of iGPSAP on-line for study and learn for years to come. See how you're doing overall and in each knowledge category. Once you've answered every question and scored at least 80%, you can immediately apply for CME credit from within your browser. In a few moments, you'll be printing your official AAGP certificate. Want to review questions in only one knowledge category? Or only those that have associated media? Or only those you answered incorrectly, or haven't answered yet? The "view" menu lets you move through any of these subsets, then back to "all questions" with a single click. Bookmark questions and add your own notes for later review. Search the entire text from one location. Give us feedback on individual questions. Evaluate the software and offer suggestions for improvement. Review the entire Content Outline. The list goes on. Discuss the epidemiology of psychiatric disorders and the genetics of geriatric psychopathology. Explain the biology of aging and describe changes associated with normal aging. Identify the cultural factors relevant to the evaluation and treatment of older adults. Describe the evaluation process and diagnostic criteria useful for identifying psychiatric disorders in the elderly population. Select appropriate diagnostic tools and treatment interventions for geriatric psychiatric disorders. Describe treatment interventions across the spectrum of geriatric practice settings. Discuss medical-legal, clinical-ethical, and financial issues related to the practice of geriatric medicine. This activity has been planned and implemented in accordance with the accreditation requirements and policies of the Accreditation Council for Continuing Medical Education (ACCME) through the joint providership of the Amedco and the American Association for Geriatric Psychiatry. Amedco is accredited by the ACCME to provide continuing medical education for physicians. Amedco designates this live activity for a maximum of 42 AMA PRA Category 1 Credits™ (expires August 15, 2020). Physicians should claim only the credit commensurate with the extent of their participation in the activity. In order to receive CME credit, participants must complete the self-examination and at least 80% of the questions correctly. Participants will be able to print out their certificates online. This program was developed following the ACCME Essential Areas and Elements related to enduring materials in continuing medical education. The official release date is August 15, 2017.